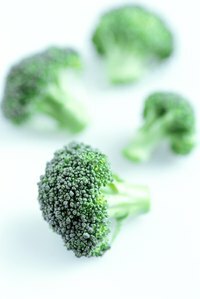 Broccoli works for a crowd since it tastes good hot, cold in a salad or at room temperature dressed with flavors such as chopped parsley, lemon zest, minced garlic and olive oil. Preparing the broccoli takes a bit of time but no special equipment and not much cooking talent. The most important task is knowing when to take the broccoli off the heat so it doesn't overcook. That leads to mushy broccoli with an unattractive grey-green color and a cabbage-like odor. Estimate how many people will be in the crowd. Provide about 1/2 cup of broccoli for every 2 people. Not everyone likes broccoli. If there are other vegetables being served, you could probably make 1/2 cup of broccoli for every 3 to 4 people. For example, for 20 people you would cook 10 cups of broccoli. One pound of chopped, fresh broccoli is about 2 cups so you would need 5 pounds of broccoli. Rinse the broccoli. Remove any leaves. Peel the stems that are more than 1 inch in diameter. Discard the peelings. Chop the broccoli into florets about the size of a golf ball. Chop the stems into pieces about 1/2 inch thick. Smaller pieces cook more quickly than stalks of broccoli, which is important when cooking for a crowd. Bring a large pot of water to the boil on high heat. Drop in the broccoli stems. Wait until the water comes back up to a boil, then lower the heat to medium. The water should still boil, just not as hard. Cook the stems for 2 minutes. Turn the heat back up so the water comes to a rolling boil. Drop in the broccoli florets. Cook for 3 to 4 minutes. The broccoli should remain bright green and be slightly undercooked. In other words, it should still be somewhat crisp. Drain the broccoli and plunge into an ice bath. This stops the cooking process immediately. When the broccoli is ice cold, remove from the ice water and pat dry. Place into zip-top baggies and refrigerate until you plan on serving. Reheat by bringing a pan of water to the boil. Drop in the broccoli and heat for no more than 1 to 2 minutes. Drain. You could also use the oven to reheat the broccoli. Place the broccoli in a roasting pan. Pour 1 to 2 cups of water in the pan. Exactly how much depends on how much broccoli you're reheating. Cover with foil and heat at 350 degrees Fahrenheit for 15 to 30 minutes until the water is steaming and the broccoli is hot. Keep the broccoli hot in a slow-cooker or in a chafing dish. If you don't have a slow-cooker or chafing dish, serve the broccoli at room temperature or cold with your favorite salad dressing or a squeeze of lemon juice and a drizzle of olive oil. Use a size pot you can easily manage to lift when filled with water and broccoli. It's better to use two pots than one big heavy pot, if there's a chance you'll drop it.